We are doing a beta podcast of concerts from Spring 2005. Hear the music: Easi Enai/Ki Va Moed. An avowed enemy of the Jewish State, David Weiss, gets hugged by another avowed enemy of Israel, and this is news? The man that just can’t keep from being a Hillul Hashem, a disgrace to G-d and the Jewish People, David Weiss, made more headlines as he embraced a major muslim leader. While he was lovey dovey in New York, his brethren in London were having a much harder time of it, getting egged this week in Goulders Green. The story has been spread around the world by the Associated Press, who have a knack of being anti-Israel. David Weiss Wins Jewish Traitor of the Year Award! We are pleased this year to have such a clear choice for the Traitor of the Year. Known for his activities to defame Judaism, David Weiss travels around the USA claiming to be a representative of authentic Judaism, while speaking only for Muslim groups. He represents a tiny cult based in Jerusalem that have boasted claims of tens of thousands of members, yet, he has to work for Palestinians. 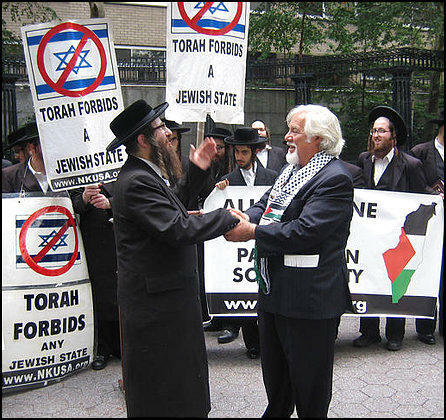 He neither speaks for Rabbis or Judaism. No one wants to be allies with David Weiss, not even the most ultra-orthodox of Jews (like Satmar) for his cooperation with people who kills Jews. So ignore his costume. He might dress like a Chasidic Jew from Hungary, but in fact he is nothing more than a character actor, or worse, a Jewish âUncle-Tom,â? doing the bidding of his masters, Hezbollah, Hamas, and the PLO. For distinguished service to Jewish enemies, deliberately increasing the danger that constantly threatens the Jewish people, by spreading false accusations, bogus claims, lies, and propaganda. For voluntary dishonesty, deceitful conduct, and distortion, posing as a scholar and Rabbi while taking checks from Jew killers, and other activities leading to the deaths of innocent people all over the world. The Presbyterian Church USA, which has more than 780 Million dollars in assets, and investments over 190 million dollars has gone off the deep end. Completely loony. Attempting to create peace in the middle East, they have voted to divest from five companies that do business with Israel. This is the same group that praised Hezbollah during their recent trip to Beirut. If you think the Presbys are making a grave error, let them know by calling their 800 number toll-free today. Not that peace is not possible, it is that peace requires a recognition of the authenticity of anotherâs position, and well, these guys only seem to understand the Arab view of history, not another. So you want to know who they want to gang up on and get to stop doing biz with the mean baddy Israelis? 0. Caterpillar â Caterpillar manufactures heavy equipment used for demolition of Palestinian homes, the uprooting of olive trees, construction of roads and infrastructure in the occupied territories for use only by Israeli settlers, and facilitating by the Israeli military. 0. Citigroup â Citigroup is a large international bank cited by the Wall Street Journal on April 20, 2005, for having moved substantial funds from charities later seen to be fronts funneling money to terrorist organizations. Some of these funds ended up as payments to the families of Palestinian suicide bombers. 0. ITT Industries â ITT Industries is a diversified manufacturer that supplies the Israeli military with communications, electronic and night vision equipment used by its forces in the occupied territories. 0. Motorola â Motorola recently won a contract to develop wireless encrypted communications for the Israeli military in the occupied territories. Additionally, it is a majority investor in one of Israel’s four cell phone companies. This investment is controversial because cell phone companies, according to the Oslo Agreement of 1995, must be licensed by the Palestinian Authority in order to operate in the West Bank and Gaza. With powerful facilities in the settlements, with a range covering all of the occupied territories, this licensing has not occurred. 0. United Technologies â United Technologies is a large military contractor whose subsidiary has provided helicopters to the Israeli military. They have been used in attacks in the occupied territories against suspected Palestinian terrorists. The company also provides other military hardware. One of the chief architects of this folly is a man that really seems like a decent chap, William Somplatsky-Jarman. The Mission Responsibility committee’s 2000 recommended actions target, among other corporations: Abbott, Aetna, Airborne Express, Allstate, American Home Products, Anheuser-Busch, Atlantic Richfield, BankAmerica, Boeing, Caterpillar, CBS, Chase Manhattan, Circuit City, Coca-Cola, Corning, Duke Energy, Eastman Kodak, Ford Motor, Gateway, General Electric, General Motors, IBM, K-Mart, Lone Star Steak House, McDonalds, J.P. Morgan, Philip Morris, Proctor & Gamble, R.J. Reynolds, Sears Roebuck, Sprint, Wal-Mart and Whirlpool.